Something Wicked This Way Comes to Avondale Estates; Step Right Up to the Nightmare Circus of the Dark Harvest Haunted House, Masquerade Ball and Festival! 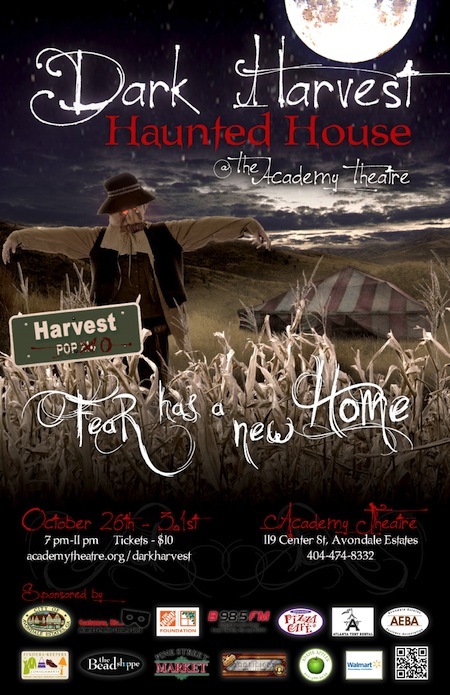 Pull back the tent flap and see what happens when the Devil himself brings the circus to town at the Dark Harvest Haunted House at the Academy Theatre in Avondale Estates! Step right up and brave the cornfields of Bradbury Farm, where the souls of a dead town grow right out of the corn, and Mr. Dark’s Nightshade Odditorium, inhabited by the spirits of long dead sideshow freaks. Oh, and did we mention the Killer Clown Maze? Another example of Atlanta’s talent in designing homegrown haunts, Dark Harvest runs Fri. Oct. 26 through Halloween (Oct. 31), with an opening night Masquerade Ball featuring some spooktacular entertainment on Fri. night and a family-friendly street carnival on Sat. Oct. 27 from noon to 5 p.m. And as an extra treat, proceeds from all the tricks will benefit local charities such as The Academy Theatre, Lifeline Animal Project and The South Dekalb Senior Center. From Ray Bradbury’s SOMETHING WICKED THIS WAY COMES to Erin Morgenstern’s recent bestselling THE NIGHT CIRCUS and countless carnival-themed horror movies (Hammer’s VAMPIRE CIRCUS  is one of our favorites and recently remastered on bluray), it’s well-established in horror fiction that circuses and carnivals can be creepy places. We caught up with Angelo Ritz, the mastermind of the entire mad affair, to find out more about his haunting Halloween history, Retro influences and the Dark Harvest experience. ATLRetro: What’s the first Halloween haunt that you remember going to as a kid and what about it scared you the most or stayed with you? When I was about eight years old, The Lake Worth Jaycees put together a charity haunted house at The Palm Beach Mall in West Palm Beach, Fla. The only thing I really remember of that first visit is seeing an 8-foot tall vampire – he seemed that big to an 8-year-old – appear out of nowhere in a strobe room and running all the way to the exit screaming like a Catholic school girl in trouble the entire way! When did you first become interested in designing your own haunt and when/what was it? After that first haunt, I was hooked on horror films – anything from Universal – Famous Monsters of Filmland and anything else I could get my hot little hands on related to monsters. The next Halloween – 1972 to be exact – I built my first haunted house in my living room for the neighborhood Trick or Treaters. It wasn’t much, but I did make one little girl wet herself! Dark Harvest has a circus/carnival theme and there’s even a Bradbury Farm area and Mr. Dark’s Nightshade Odditorium. How much of an influence was SOMETHING WICKED THIS WAY COMES by Ray Bradbury on the design? Was that story particularly scary for you as a child? I’m thrilled that you picked up on the reference! As a child, I don’t think any other piece of genre literature had a more profound effect on me than SOMETHING WICKED. It wasn’t particularly scary to me, but for the first time I think I finally understood the human side to horror literature, that the true nature of an individual can be more monstrous than any zombie or vampire I had seen up to that point. 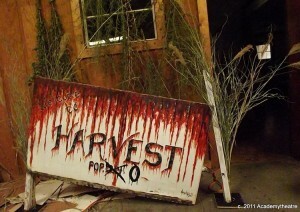 What other classic horror stories or movies provided inspiration for Dark Harvest? I would say Tod Browning’s FREAKS (1932) and a little dash of David Lynch‘s ERASERHEAD (1977). Clowns are supposed to be funny, but creepy clowns have become a special trope in horror movies and fiction (Stephen King’s IT comes immediately to mind). Who are some of your favorite killer clowns and why do you think clowns are so scary to so many people? Stephen King’s IT, hands down! All others pale in comparison. The book kept me up nights for about a month! 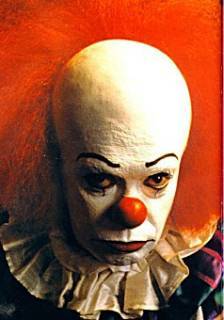 The miniseries may not have been great, but Tim Curry as Pennywise haunted my dreams for a good while after. 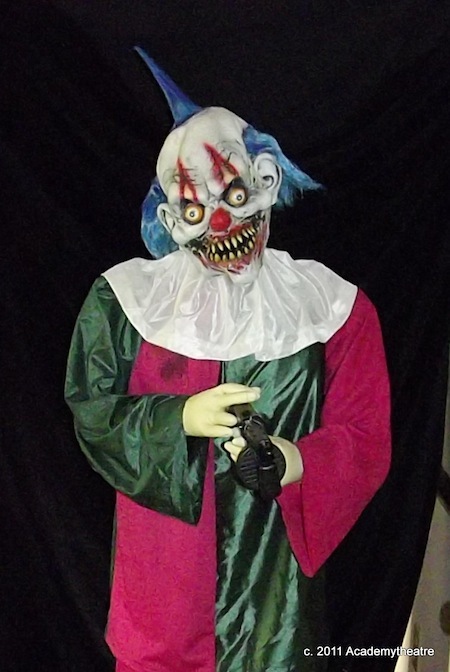 I think people are frightened by clowns for a very simple reason – you never know what’s really under that white make-up and painted-on smile! 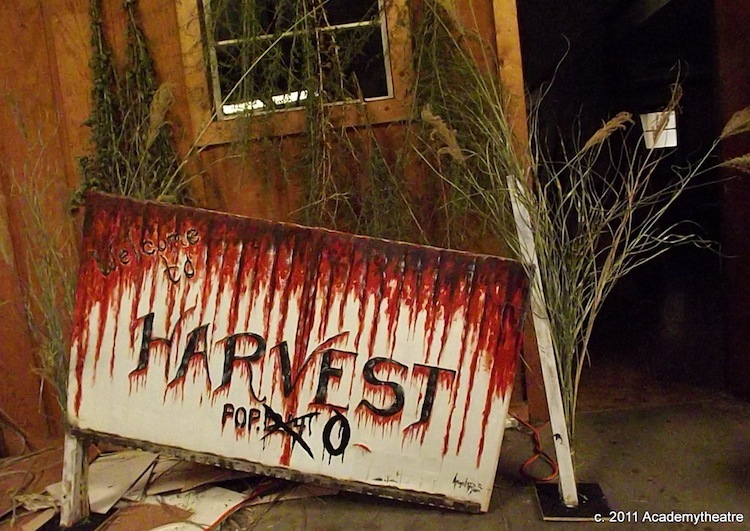 Without giving away any spoilers, is there anything else you’d like to point out that’s different about Dark Harvest compared to Atlanta’s other haunted attractions? The one big difference is the absence of gore. Don’t get me wrong, gore is very effective in the right context, but considering the source material the show is based on, I felt classic scare techniques were more appropriate. Tim Curry plays Pennywise in the ABC-TV miniseries of Stephen King's IT (1990). On Friday night, there’s a masquerade ball. The Artifice Club’s Doctor Q will be spinning, but what else will be going on and will there be costume prizes? We have a great line-up of live entertainment for the ball. Gwen Hughes and The Retro Jazz Kats, The City Gate Dance Theatre Company, Thimblerig Circusand the incomparable Aqualencia Litre. Everyone who attends also gets a VIP (no waiting in line) ticket to the haunt. For the costume contest, there will be trophies in a few categories. I want to keep those under my hat for now! The family festival on the weekend reminds me of the Halloween school and church carnivals when we were kids. Do you have a favorite childhood Halloween carnival memory and is that the idea – to bring back that tradition? I think you hit the nail on the head. After my first living room haunt, I built two houses for middle school fundraisers, and I wanted younger children to be able to have as much fun as I did at that age. We are going to have a few different scare levels during the festival to accommodate all ages, including “ The Trick or Treat Haunted House” for the very young (3 to 5 years old) where the actors will give out candy. Can you talk briefly about the charities that the haunt will benefit? The haunt will benefit Lifeline Animal Project – a no-kill shelter and pet-fostering facility. The South Dekalb Senior Center – they are greatly in need of art supplies and an instructor for their senior activity program. And The Academy Theatre’s Theater for Youth outreach program. All artwork courtesy of Dark Harvest and provided by Angelo Ritz.